There are a wide variety of decorative and ornamental plants that go by the popular name "elephant ears" because of their very large leaves. Compare with my size 8 shoe. This is underside of a fallen leaf. Elephant ears are among the 2,500 known species of plants that generate heat in much the same way as warm-blooded animals. Some flowering elephant ears actually raise their temperatures close to human body temperatures while in bloom! Even more amazing is the relationship between many elephant ears and the scarab beetle. 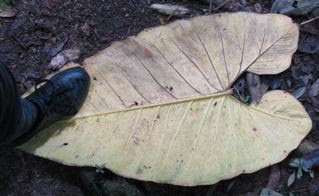 It has only recently been learned that many elephant ears depend completely on the scarab beetle for pollination. Elephant ears produce a flower stalk, called a spadix, which has three different kinds of flowers, male, female, and sterile. The beetles live to eat the sterile flowers and on the process of crawling around the spadix the beetles pick up the pollen from the male flowers and pollinate the female flowers. Incidentally, while the male and female flowers look exactly like the sterile flowers, they are never eaten. This close dependency between totally unrelated creatures which have special features perfectly suited to one another bears witness to an overall plan and Planner for all the creation. And if our Creator has made such detailed provisions for these plants, which are here today and soon gone, you can rest assured that He has made many more provisions for you and all of mankind. Listen to this radio episode of Creation Moments.